"Unfortunately, the Ukrainian provocation in the Black Sea, as well as the general situation in the region, continues to be used by a number of Western countries, including the UK, to stir anti-Russian rhetoric. The details of the incident, most notably the blatant and deliberate violation of the territorial waters of the Russian Federation by the Ukrainian ships, are ignored by the UK Government," the embassy’s spokesperson said at a briefing. The embassy noted that the Kerch Strait incident "curiously" coincided with Kiev deploying major offensive components to Donbas. "Blaming Russia for an ‘escalation in the Sea of Azov’, London conceals the fact that on 25 November the Ukrainian side violated the Russian border in the place that had been Russian territory even before the events of 2014. The Ukrainians rejected an offer of pilotage and were treacherously heading towards into the Kerch Strait from the south. Two officers of the Ukrainian security service present aboard one of the ships, later admitted they had a special task to act the way they did," the embassy underlined. 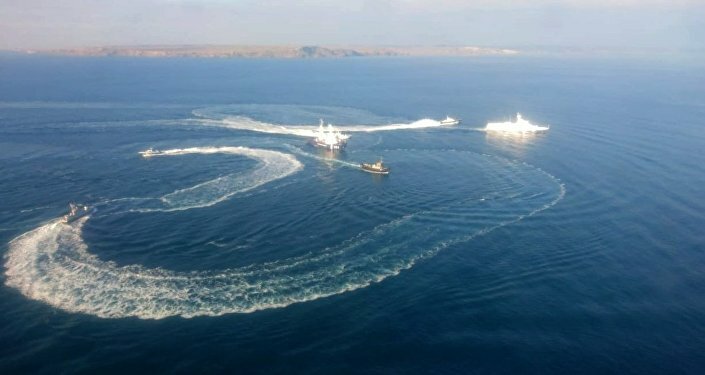 On November 25, three ships of the Ukrainian Navy — Berdyansk, Nikopol, and Yany Kapu — illegally crossed the Russian border, entered Russian territorial waters that were temporarily closed, and began moving toward the Kerch Strait, which serves as an entrance into the Sea of Azov. The Ukrainian vessels and their crew were detained by Russia after failing to respond to a lawful demand to stop. Following the incident, Kiev authorities declared martial law in several Ukrainian regions located near the Russian border and the coasts of the Black Sea and the Sea of Azov. The measure will be in place for 30 days. Russian President Vladimir Putin has said that the incident was a provocation prepared in advance as a pretext to introduce martial law in Ukraine ahead of the country’s presidential election. The martial law would affect the campaign, set to start in late December, amid Ukrainian President Petro Poroshenko's low approval ratings, Putin said.